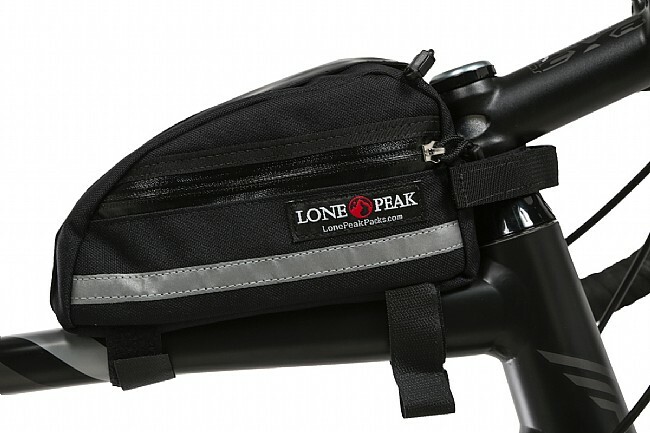 If you've found yourself overstuffing Lone Peak's original Kickback Top Tube Bag, the Kickback II is 2.5" longer so you can really load up during your next mid-ride stop. 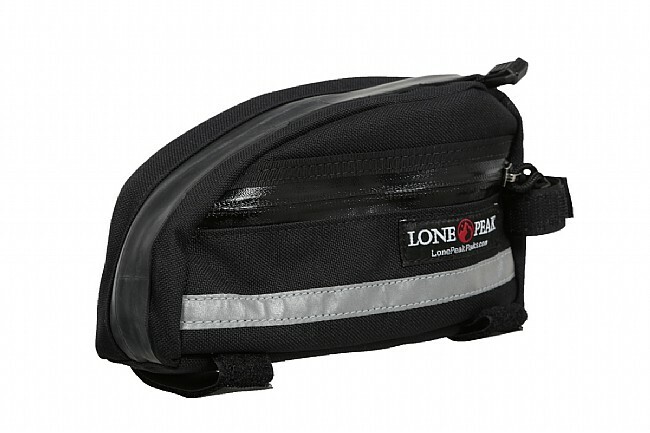 It's hand-stitched in the USA from 1000D water-resistant nylon, featuring a weather-sealed YKK zipper at the side pocket, and a recycled inner tube over the YKK zipper for the main compartment to further increase protection from the elements. 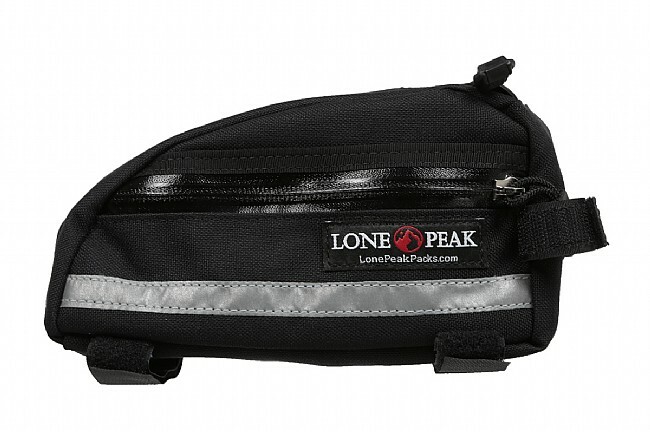 Perfect for food, a wallet, and a phone, the lining contains high-density closed-cell foam to keep your contents safe and to add structure to the pack. It attaches using 2 Velcro straps on the top tube and one more around the fork steerer for a secure fit. Features reflective accents for increased visibility in low light. 8" long x 3.5" tall x 2" wide. Claimed weight is 4 oz. This is the right size for a top tube bag. You won't fit your sleeping bag in it, but it will hold tools, phone, tube. It doesn't mash my crotch when standing over the bar, this is a plus. Good bag with plenty of capacity. Front strap is too long for any of the bikes I tried so i resewed the velro shorter. Now it fits perfectly. Big enough for your cell phone, some snacks, and a few other small things. Its also narrow enough my legs dont hit it when climbing out of the saddle. Good quality. Very nice. Wallet, keys, cell phone - that's it. Very nice. Wallet, keys, cell phone - that's it. Contents stayed dry in a moderate rain. I have not ridden in a downpour yet. I recommend this product.